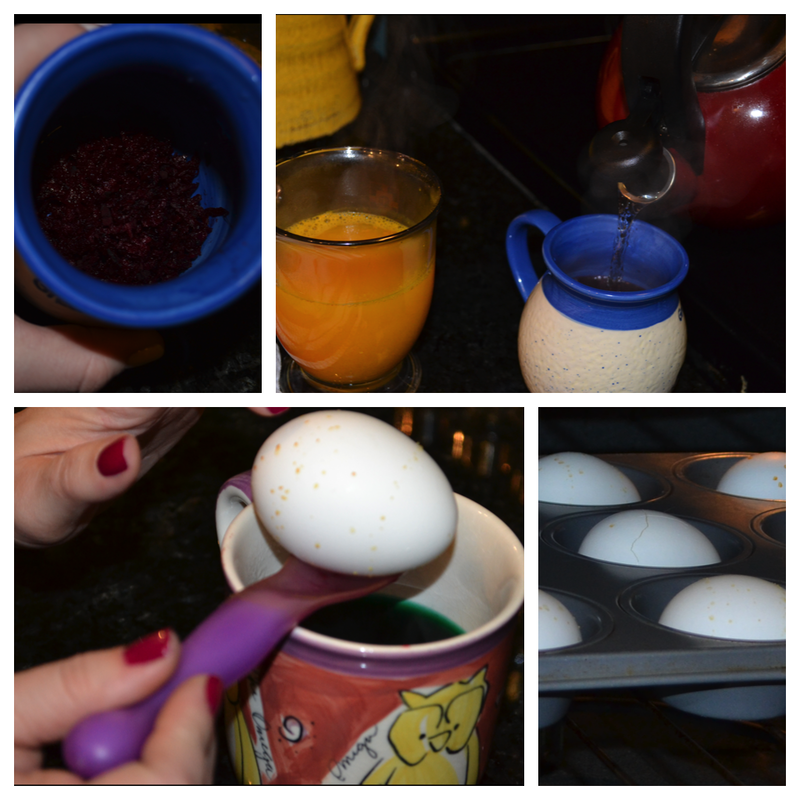 Egg dyeing has long been a tradition the Saturday before Easter in my family. 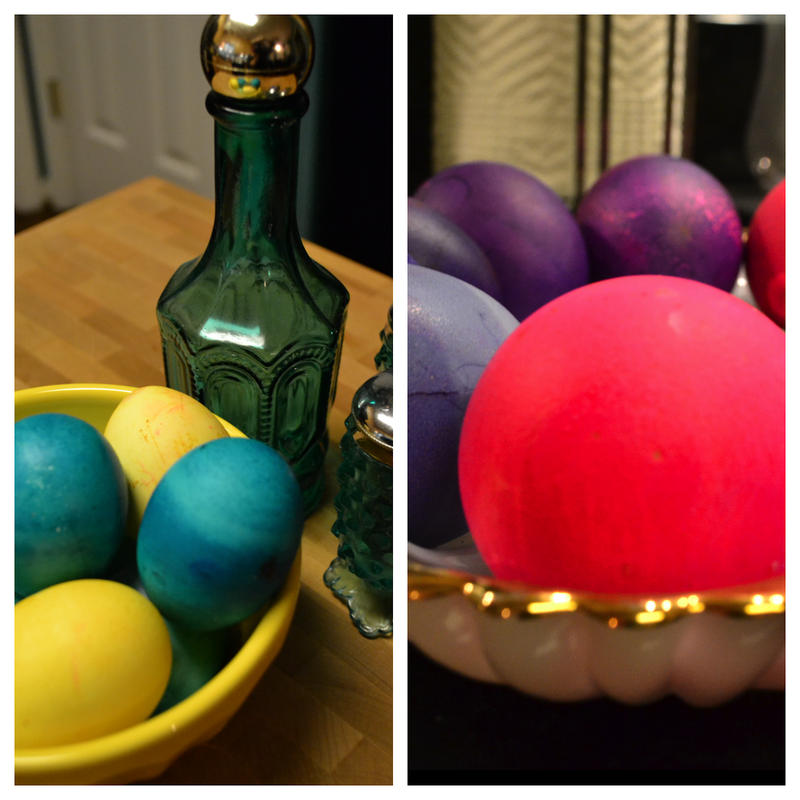 With the itch to create something and always loving Easter egg dyeing, I jumped ahead and decided to create my own dyes from things I had in my home already rather than going out and getting the typical dye in a box. Those eggs always come out the same and this year I wanted brilliant color. My original idea was to color these eggs then dip them in gold paint on one side but honestly, once I pulled them out of the dyes, they were so brilliantly colored I decided to leave them be. Your screen does not lie-they were that bright! Armed with my friend Whitney and not much of a plan, we set forth to rummage in my kitchen and create some dyes. I had perused some sources on natural egg dyes from vegetables and decided to do two different ones (actually three-the grape juice dye was bad). I chose a magenta red and a golden yellow, aka beets and turmeric. I combined a teaspoon of white vinegar, 2/3 cup of boiling water and then added in the colorant to each cup-6 tablespoons of grated beets to one cup for the red and two teaspoons of ground turmeric in the other. I grated the beets Friday night and used the rest for my dinner. The red color is beautiful but definitely gets everywhere-it looked like a small murder had happened in my kitchen. The beets yielded a regal red-purple color. The egg in the photo above at the 1:00 angle is the first egg out of the beet dye. Turmeric is a yellow spice used in a lot of middle eastern or asian dishes and I had some for a recent Moroccan meal. It's an easy find in a supermarket but not exactly a spice staple. The color is beautiful but like most yellow dyes, we did have to leave those in a little longer than most-that is the key-leaving the egg in longer allows for a much deeper color. Since we were chatting while we played, this was easy to do. 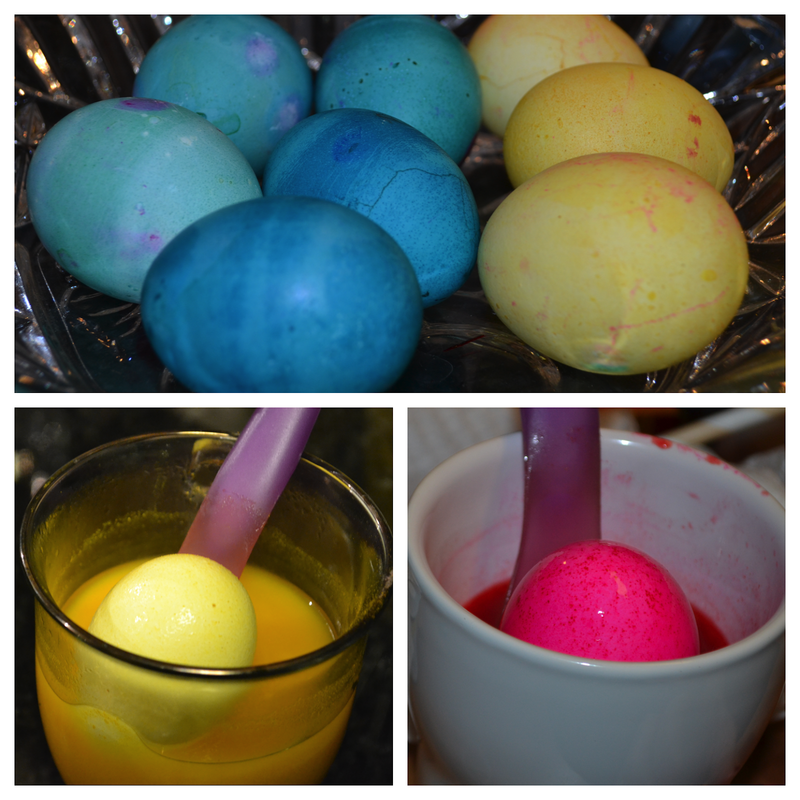 Bottom left: Going into to the teal dye | Bottom right: We "boiled" our eggs in muffin tins for a change. Bottom left: Our first turmeric egg was a bright one! | Bottom right: This egg was immediately that color once it was dipped in and pulled right back out. Typical food coloring can be used as egg dye and it even has some formulas for color on the back of the box. I had a couple of green, a yellow and a blue. I also found some icing dye in little bottles (not sure where those came from) labeled "rose" and "teal." I'm sure you can get these types of bottles at Kroger or Wal Mart in the cake decorating areas. The teal was beautiful-we actually did the teal icing coloring as well as the food coloring instructions for teal as well. That helped us achieve a really deep color. We also took eggs that had been dyed in the beets and dipped them a second time in the teal to get the really brilliant purple colored eggs. The pink was such a neon pink it hurt my eyes! We put the icing dye directly in the cup with vinegar and water just like the rest of the colors and it was almost instantly pink. Thus, we created the ombre effect of pinks and purples of varying tones and shades. Whitney even tested a steady hand and patience and created the cute little ombre egg! Once you have your main colors going, mix and match-dip the turmeric egg in the pink icing dye for a coral color...try the beet dye with the teal dye for the deepest cobalt-purple. Try your hand at the ombre effect, which is easy to do with a little patience! Line your eggs up on a pretty tray or fill up a bowl and let them brighten your day. Warning: If you really want to eat the Easter egg, do so not long after boiling and dyeing-you don't want to eat the egg if it hasn't been refrigerated! Tip: Make sure your muffin tin is spotless because the eggs will somehow pick up the tiniest crumb.